Spacious accommodations complete with special privileges like priority check-in, personalized Concierge service, priority seating time preferences in the main dining room and specialty restaurants, upgraded room service menu, evening hors d’oeuvres, plush bathrobes, and veranda with lounge seating. 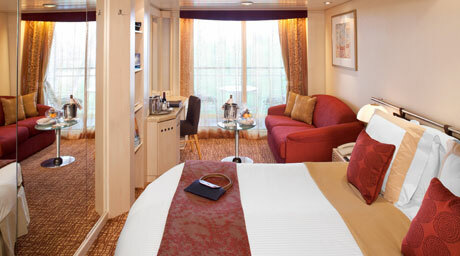 Staterooms 8047, 9064, 9066, 9071, 9073, 9090, 9092 and 9098 have partially obstructed views. 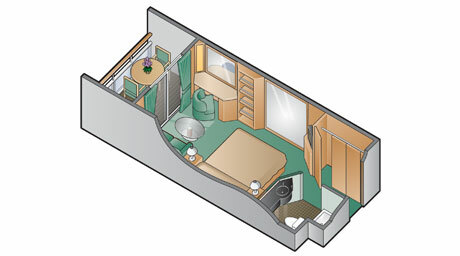 Staterooms 9117, 9121 and 9123 have roll-in showers and do not have bathtubs.